John P. Laborde’s connection to the LSU Paul M. Hebert Law Center spans seven decades and is rich with accomplishment. His extensive service to LSU Law includes multiple volunteer leadership roles. Laborde’s loyalty to the center and rare distinction in professional achievement were acknowledged by his receipt of LSU Law’s Distinguished Alumnus of the Year honor in 1993 and again in 2013, when the center presented Laborde with its Distinguished Service Award. Laborde’s fondness and desire to support the Law Center culminated with the announcement of a transformational gift that will ensure support of LSU Law for decades to come. Laborde’s $2 million gift—the largest gift in the history of LSU Law—will create a $1.2 million Double Endowed Chair in Energy Law and direct $800,000 to a programmatic support fund to establish the LSU John P. Laborde Energy Law Center. In October 2012, the LSU Board of Supervisors approved the naming of the Energy Law Center in honor of Laborde. The recently established academic and research center recognizes Laborde’s service to LSU Law and his historic gift. 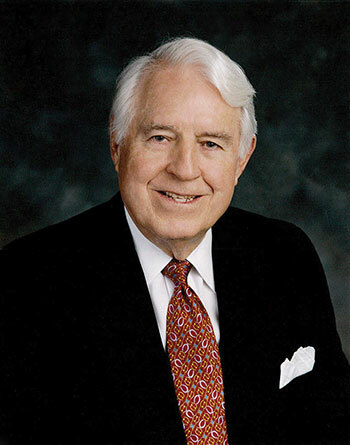 Following his graduation from LSU Law in 1949, Laborde spent five years with Richardson & Bass, an independent oil and gas exploration company, then 40 years leading Tidewater Marine, an international marine service company that he co-founded. Tidewater’s story began in 1955, when a group of investors, led by the Laborde family of New Orleans, pioneered the development of the first offshore service vessel tailor-made to support the new and growing offshore oil and gas industry. A year later, Tidewater Marine Service, Inc. commenced operations as a publicly owned company with John P. Laborde at the helm. Now, more than 55 years and many vessels later, Tidewater remains the leader of the industry it created. Laborde has served on the Boards of several major corporations, including BellSouth Corp., American Bankers Insurance Group, United Gas Pipeline Co., Stewart Enterprises, Inc., and VT Halter Marine, Inc. He is chairman of the board of Laborde Marine Lifts, Inc., Laborde Products, Inc., Lab-More Properties LLC, and Laborde Integrated Services, Inc., and serves on the board of Stone Energy Corporation. He retired from Tidewater in 1994. Laborde, a World War II veteran who served on General Douglas MacArthur’s staff, is a longtime member of the Law Center’s Chancellor’s Council and a former member of its Alumni Board of Trustees and Forever LSU Campaign Steering Committee. He served as chair of the Law Center’s Annual Fund Campaign from 1999-2003. Laborde’s dedication and ties to LSU span many years. In 1983, he was named to the LSU Alumni Association Hall of Distinction, and he is a former Alumnus of the Year and past president of the association. He received an honorary doctorate from LSU in 1995 and was inducted into the Cadets of the Ole War Skule in 1998. His philanthropy has extended to many parts of the campus, among them the Law Center’s endowed professorship and scholarship programs; the LSU Foundation; the Flagship Fund; the LSU War Memorial Fund, Cadets of the Ole War Skule and the Military Endowment; the Alumni Fund; and the Louisiana Sea Grant program endowed chair program. The John P. Laborde Energy Law Center is led by Robert “Bob” Sloan, who joined LSU Law last November to serve as director of the center and professor of professional practice. He is joined by two experienced energy and environmental attorneys—Keith B. Hall, assistant professor of law and director of the Law Center’s Mineral Law Institute, and Blake Hudson, associate professor of law.